NOTE: The Selma Bridge Crossing Jubilee (February 27- March 5, 2019) trip has been cancelled. The Resource Center for Nonviolence Cultural Exchange SELMA (CE SELMA) program provides opportunities for people of all ages to integrate intercultural understanding and develop culturally inclusive perspectives. Resources included in the program are geared toward developing knowledge about culture, cultural diversity and identity within the context of the United States. Our program is designed to expose individuals to people from different cultural, religious, geographic and socio-economic backgrounds and in so doing provide the opportunity for participants to develop a greater understanding of diversity – both in the United States and worldwide. We encourage everyone to interact with and learn from people who are different from themselves and to participate in new and unique experiences beyond their own communities. CE SELMA assists participants to develop positive relationships with others, understand a broader range of perspectives, and develop the knowledge and skills needed for participation in our multicultural society. 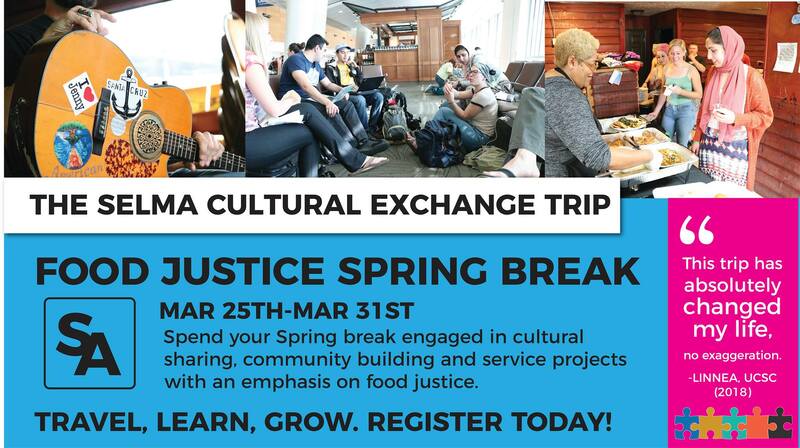 Cultural Exchange SELMA is managed by the Resource Center for Nonviolence. SPACE IS LIMITED! REGISTER TODAY TO RESERVE YOUR SPOT! • Collecting oral histories of foot soldiers, transcribing of oral histories and/or archiving at the National Voting Rights Museum. • Cleaning the Civil Rights Memorial Park. • Voter registration, education and mobilization. • Canvassing communities to hear current concerns for strategic planning to include the community’s voice. • Teaching nonviolence and/or conflict resolution to youth using the arts. • Helping with the Community Garden in Ward 4. • Co-hosting a community radio program regarding current social justice issues. Find a way to say YES! Posted in Nonviolence, Social Change.